The reply below to the comments and suggestions to the planned activities for the 2012 Balikbayan Grand Homecoming was sent in by SAUSA president, Mr. Eleno Annaguey, Jr.
On behalf of the Sagunto Association USA(SAUSA), we appreciate, we welcome, and we thank you for all your comments and suggestions regarding the planned activities for our 2012 Balikbayan Grand Homecoming. Let me try to address most of the issues, suggestions and questions that have been raised on our online presence SaguntoStar.com and on the Sagunto Stars facebook group. Suggestions that are specific to the 2012 Balikbayan Grand Homecoming will be presented to the host association for consideration and approval during our next planning meeting. There will be a men and women’s volleyball tournament and a women’s basketball tournament in addition to the men’s senior and junior basketball tournaments. We thank you for the reminder. 2.) maribeth esteban says: since there are several days for games and fun why don’t we schedule an exclusive “kadawyan” games and activities( like kadangkadang can’t recall as of now but i know aduda) in one day. i think its fun reminiscing the old times… new games from the tv shows can be done for another too. It is our goal to have fun and to reminisce the old times. That is why we are asking for suggestions. Our program activities committee will be compiling a list of all suggested games and activities and these will be presented for approval in our next planning session. 3.) 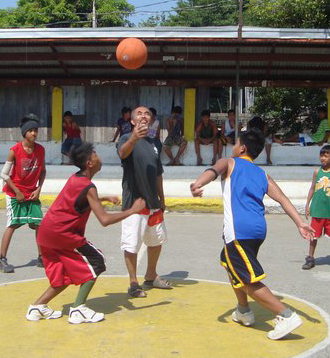 jwun says: apay ngay nga kasla nag dull ti 2nd barangay homecoming? 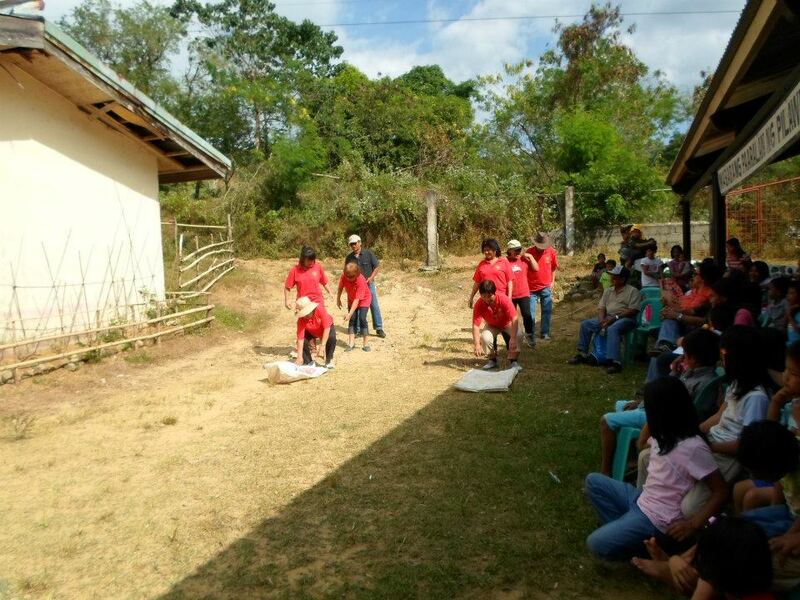 Kasla nag dull ti 2nd barangay homecoming gapu ta ‘ancient’ dagiti nagplano ti original actividades ket isu met ti malagip da nga naar-aramid dita barangay tayo idi tiempo da. This is exactly what I told the membership, ‘not exactly dull but maybe out of tune with the times’ and for the committees to please coordinate and contact the Sagunto local organizations, especially the SK, since they are aware of the current and ‘in’ activities. No siak laeng a maysa, patalunton idiay hi-way will be one of the activities. Isu nga agdamag kami ti suggestions yo. 4.) jwun says: A community sing-a-long and games to be led by all the Sagunto churches will not be possible due to conventions and rallies which normally happen on these dates for most of the churches in sagunto. During our initial planning meeting held last year, some of our membership requested not to hold any activities for the evening of Dec 28th. In deference to them, the association agreed to the request. Lately, I was informed that we can have some sort of religious program during that night. If, as jwun says that this is not possible due to church convention and rallies, then at this time, and it may change, SAUSA will have no planned activities for the evening of Dec 28th. Any group or organization can plan or organize an event for the evening, or for those who can, just have a ”no-host let us get together at the abong to tsismis and tell Apo Tikmaan stories, reminisce, and have a good time”. 3.	agiguyod ti pasagad nga adda nakasakay tallo nga tao ( 10 meters distance)…. ngem exception ni Apo Balak ken Bakal ta ay apo kasla da laeng agperpersay ti kamatis nga sidaen da ah no kasta, ketno strong dan! Mayat! I suggest nga Awan a ti ma-exempt. Maybe we can do it in 2 parts. The winner of the first part will be declared as the challenger and will then challenge the reigning champion in the 2nd part. Winner of the 2nd part will reign as Sagunto’s Iron Man until the next challenge. 1.) On Demelza April Doctolero’s suggestion: that we establish an annual award for the most outstanding person of Sagunto. For this year’s Balikbayan Grand Homecoming, we have already planned on designating a Mr and Mrs Balikbayan to be chosen on-the-spot during the balikbayan night Dec 29th. As Demelza’s above suggestion is for an annual most outstanding person of Sagunto, I recommend that this award be a part of our annual Thanksgiving and Jose Rizal Day Celebration with a selection committee consisting of Sagunto local residents and OFWs. 2.) On Demelza April Doctolero’s suggestion that the entire OFW of Barangay Sagunto establish a Foundation/Institution focusing on Education. A very good suggestion and I support it. There is already a planned meeting (no specific date yet) to be held after the homecoming events to decide which project/s we can use the proceeds of the 2012 Reunion Souvenir Program Ad subscriptions fund raiser. We can add this to the meeting agenda. Bring your suggestion and recommendations and plans on how to best implement it. 3.) On Demelza April Doctolero’s suggestion that ”It is Grand,so why not officially start… on the night of the Grand Homecoming…And this will run throughout the year..we can work this together easily because web media is available already”. When SAUSA first met and accepted the task of hosting and planning the 2012 Homecoming events, we have temporarily set, as is being suggested here, to have the Balikbayan night on the first night (27th) and the talent show on the 29th. When the dates were announced, we have received comments from kabarangayans that they will not be able to travel until after Christmas day due to family and/or work obligations. We switched the schedule to accommodate and give balikbayans enough time to travel and be able to attend the Balikbayan night. 4.) On Ems Homma’s suggestion that we allot another fundraising night, a “Gay fashion show/ contest” … a good time for balikbayans to relax…. The idea of having a ‘Gay fashion show/contest’ similar to what was held during the 2008 Grand Homecoming was also brought out during SAUSA’s first planning meeting. It was decided by the membership then to have the ‘Sagunto talent show’ instead of the ‘Gay fashion show’. At this time, SAUSA feels that we already have a full schedule with the Talent Show, Balikbayan Night, Tournaments, plus the annual Rizal Day Celebration, and the Medical Outreach. If any organization or any group of Balikbayans is willing to plan and organize the Gay Fashiow show event, then please feel free to do so. This fundraising coud benefit “Sagunto scholars”. We have lots of students in need of support and grants. If we could at least give them some amount, or full scholarship, from this mini event “Gay Fashion show”, they could continue studying and improve the economic condition of our community. This can be a temporary means for raising funds that will benefit Sagunto scholars. Personally, I believe Demelza’s suggestion of establishing a Foundation/Institution is a more permanent solution to our Barangay Education needs. Again, we thank you and we welcome any comments and suggestions that you have. Agyaman kami kadagiti amin nga comments ken suggestions yo. On behalf of the Sagunto Association USA. This entry was posted in Sagunto and tagged fiesta, homecoming, reunion on September 25, 2012 by Jeanette. We would like to invite you to participate to the said tournament scheduled on October 15 – December 28,2012. The tournament is open for all ages. If you have questions, feel free to contact us. We look forward to your participation. This entry was posted in basketball, Sagunto and tagged basketball, homecoming, invitational, reunion, Sagunto on September 13, 2012 by Jeanette. The proposed schedule for the 2012 Sagunto Balikbayan Grand Homecoming was submitted by SAUSA president, Eleno Q. Annaguey, Jr. Your comments are welcome. Dec 28, 2012 Day – 1K or 2K Run/Walk thru Sagunto – prizes will be awarded by age group. Dec 28, 2012 Evening – Originally, there are no events scheduled for the evening of Dec 28. There is no event scheduled as yet but there have been a couple of suggestions lately. 1.) A community sing-a-long and games to be led by all the Sagunto churches. 2.) Waiting for more details on the 2nd suggestion. 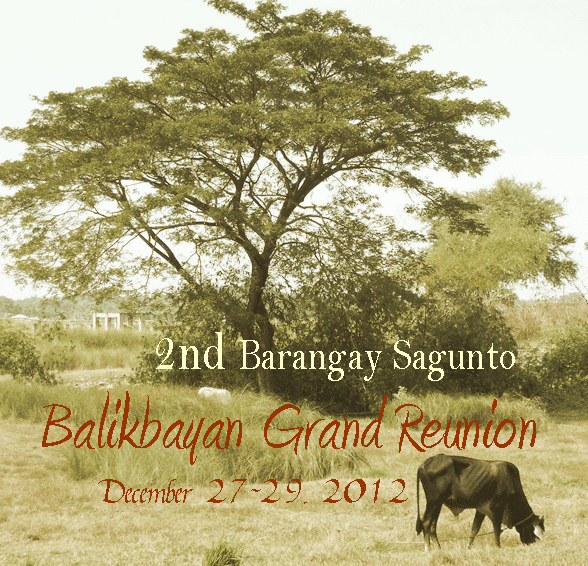 Dec 29, 2012 Evening – Balikbayan Grand Reunion. Dinner for all of Sagunto and its sitios. Presentation of all Sagunto Balikbayan groups, local organizations, and churches. Inniliw . Dance with the DJ music, dance with the gongs, dance with the drums. Dance the night away. Dec 30, 2012 – Annual Thanksgiving and Jose Rizal Day Celebration. This entry was posted in Announcements, Featured, Sagunto and tagged fiesta, homecoming, reunion, Rizal Day on August 30, 2012 by Jeanette. The following is an update from SAUSA president, Eleno Q. Annaguey, Jr., regarding the planning of the medical outreach scheduled during the balikbayan homecoming in December. If you have not already reserved your page on the souvenir program, do so soon! Click HERE for details. During my vacation to the Philippines last May, I met with our Honorable Mayor Mina Joy Pangasinan to let her know of our intention to hold a medical outreach in Sagunto as part of our Grand Homecoming activities. It was an informal meeting to ask for her permission for such an event to be held. I also asked her for the help of our municipality’s medical personnel, and the possible use of the municipal ambulance. She gave me a positive response and told me to extend her thanks to the association’s membership for planning and sponsoring the medical mission. The Honorable Mayor asked me the scope of the mission and whether it was just for Sagunto or we are including the neighboring barangays. I responded that at that time and because of limited resources, the plan is only for a medical check-up, eyeglass giveaway, and health education/seminars for Sagunto and its sitios. Since my meeting with the mayor, I have added members to the medical outreach committee and talked with the association’s membership. We have also started asking for voluntary donations for the medical outreach from our kabarangayans abroad and all friends of Sagunto. At this time our planning effort is geared to expanding the original intent (services and area to be served) of the medical outreach. I still need to send to our Honorable Mayor a letter of intent and the scope of the project. I have requested Mr. and Mrs. Ed and Carvilyn dela Cruz to be members of the committee. As most of us know, Eddie and Carvilyn have done previous medical missions. They have already informed me that contacts and arrangements for medical doctors were already made. I just need to follow up when I go back home. Our medical committee coordinator, Mrs. Zenaida Velasco, during her vacation to the Philippines last May, has also made arrangements for discounted prices on medicines if we need to purchase medicines. Mrs. Marlene Dapiaoen-Puente is currently coordinating through her contacts the procurement of medicines and other materials needed. Mrs. Emily Benosa-Homma is coordinating the eyeglass giveaway as she has always done in the past when she goes home. We need donations of new or used eyeglasses. This entry was posted in Announcements, Featured, Sagunto and tagged homecoming, Medical Outreach, reunion, SAUSA on August 30, 2012 by Jeanette.